Shallots are important ingredients in Southeast Asia kitchen. They are called for in almost majority of Indonesian recipes if I can put it that way. They are used for stir-fry, stew, deep-fried as toppings, and also eaten raw too. It’s one of my favorite ingredient to cook with as well. 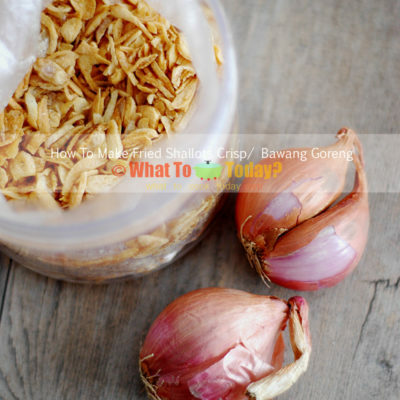 We call shallots as “bawang merah” in Indonesia. The Southeast Asian version of shallots are much more smaller in size and more intense in color, purplish red. The European version of shallots are longer and bigger and more pale in color. 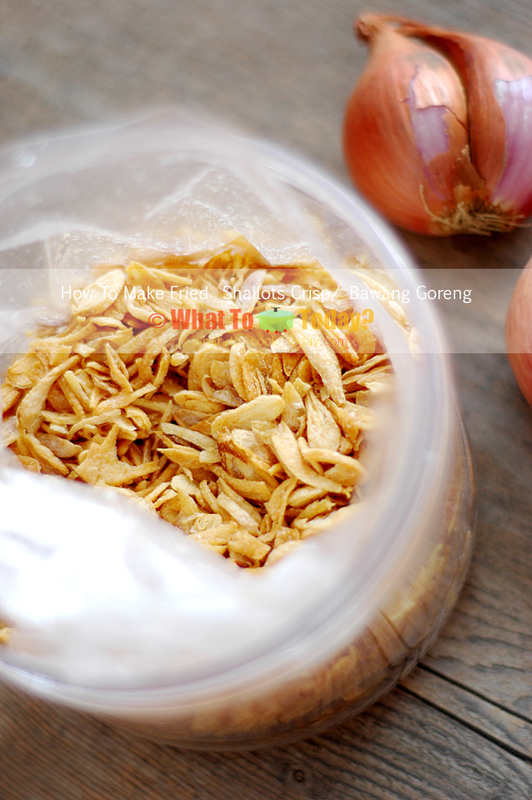 Fried shallots crisp or known as bawang goreng in Indonesia is a highly popular topping on dishes like noodles, curry, rice, salad, etc. I personally LOVE..LOVE fried shallots crisp. In fact, each time if a family member come to visit us, I always ask them to help me get fried shallots crisp from Indonesia. Fried shallots crisp is available here in the Asian grocery store too. My mom complained about it not being “original” enough 🙂 and I can’t blame her for that because if you eat the two side by side, you’ll know what I mean. 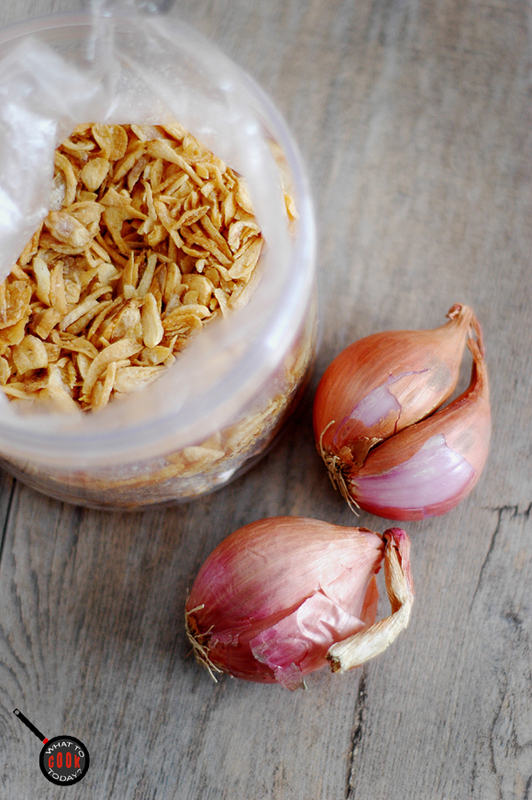 Making your own fried shallots aren’t too terribly complicated. Some work like slicing the shallots is required and that also means some tears 🙂 Maybe putting on the onion goggles will help 🙂 The shallots are usually thinly sliced and then soaked in the water and then let them air dried. This method will ensure you consistently get a crispy shallots. Pour oil into a wok or wide skillet and preheat until really hot. When oil is ready, gently put the sliced shallots into the hot oil and fry until they are light golden brown and crispy. Remove with slotted spoon and place on absorbent paper towel and repeat to fry in small batches. Oo, yum. I bet these would perk up so many different dishes just by sprinkling a pinch or two over them at the end! 🙂 I never thought about making my own fried shallots before, but it’s a great idea for preserving shallots actually– for when I buy too many and I’m not going to be able to use them all up quickly enough. Yes, I agree. Actually preserving shallots are pretty common too in Indonesia. Usually they are pickled with cucumber and some fresh chili! yummm!!! After slice the shallots you have to put into water and some salt as much as you want (don’t too much) then put the cornstarch or flour 1:1 or less (this is to make your fried shallots more crispy). Iny last few attemps my shallots turn out soggy and not crispy. In the past there were times it was crispy….I dunno wwhat went wrong. – or is just my poor control of fire.